We love this idea for the wedding toss - rather than rice or bird seed ask guests to throw paper planes after the ceremony or when you leave the reception. Have a basket of planes ready to throw, of course they are super easy to make so this wont take long, or display them in an old suitcase to keep the travel theme going. 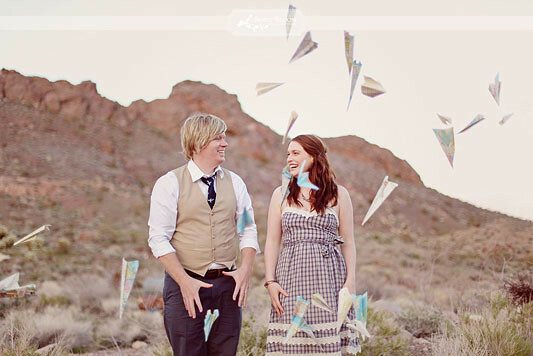 They also make fantastic props for engagements shoots, below, this couple used paper planes folded from old maps to make their photos a little more fun. Makes for some GREAT photos! Perfect for a pilot or stewardess getting married.... or anyone who's playful and likes to step "out of the box." Love this idea.